SeeYa, Davichi and T-ara will comeback with their 2nd project single ‘Wonder Woman’ after ‘Female Generation’. There were 5 members for their first project – SeeYa YeonJi, Boram, Davichi HaeRi, MinKyung and T-ara JiYeon. But for this project, it will be a 7-member one with new members SeeYa SooMi, T-ara HyoMin and EunJung with the song ‘Wonder Woman’ written and composed by Jo YeongSoo. KBS Music Bank 18.12.2009 – 2PM wins 4th consecutive #1 on K Chart! Today on KBS Music Bank, the winner of #1 on K Chart goes to 2PM with ‘Heartbeat’ – it’s their 4th consecutive win! Other hot performances by SHINee, After School, T-ara, BEAST, YounHa, Rainbow, U-Kiss etc. SeeYa, Davichi and T-ara will come together again for ‘Female Generation 2′. Coming 7th January next year, SeeYa, Davichi and T-ara will be releasing ‘Female Generation 2′. Previously in May, this project group released their project single ‘Female Generation’ and had received positive responses from music fans. SeeYa, who has now a new member SooMi, together with group Davichi who gave us hits like ‘8282′ will be joined with T-ara who are recently gaining much popularity with their new song ‘Bo Peep Bo Peep’ for this project single. Girlgroup members have picked 2PM TaecYeon as the #1 male idol. On Star Golden Bell filmed on 7th December, various girlgroup members have appeared on the show like Davichi Kang MinKyung, 4Minute HyunA, After School JooYeon, SeeYa BoRam SooMi and Secret Jeon HyoSeong. And MC Jeon HyunMoo asked Kang MinKyung, “Which male idol do you get most nervous when you see him” and she answered 2PM TaecYeon. 4Minute releases a new Christmas song with Maria and Amen. For a change after their dance hit songs like ‘Hot Issue’ and ‘Muzik’, 4Minute shows their vocal capabiltiies through the releases of a Christmas song ‘Jingle Jingle’ with singer Mario and rapper Amen. The song is written by Han SangWon, who produced many hit songs for singers like SeeYa, VOS, SS501, Bada, IU etc. One great song for the season. 2PM is said to have dominated the Monkey3 weekly chart. For the 2nd week of music site Monkey3 (9th~15th Nov), 2PM’s ‘Tired Of Waiting’ is #1 on the weekly chart. Also 2 other songs are on the top 10 ranks – ‘Crazy For You’ at #8 and ‘Heartbeat’ at #9. Meanwhile, Brown Eyed Girls‘ new song ‘Sign’ is at #2 position for the 2nd week through. Last week #1 on the chart was 2NE1 Park Bom’s solo single ‘You and I’. 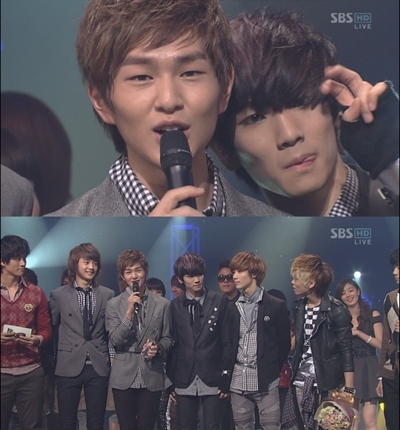 For SBS Inkigayo today, SHINee wins their 1st Mutizen with their current hit ‘Ring Ding Dong’! The song is also #2 on the digital mobile ranking chart on the show.